We leave in the wee hours of tomorrow morning for a trip to Israel – my sister-in-law is getting married. It will be the first time I’ve been back in almost ten years, so I’m pretty excited. I taught there at an international school for a few years, and it is where I met my husband. Yarn for a mistake rib color block scarf to knit on the plane. Since I can’t take my sewing machine with me, it will be an all knitting trip. So hard to judge how much to take. When I was there before there weren’t really any yarn stores – just a little acrylic tucked in the corners of general stores. It was in Israel where I restarted my knitting. I’d knit years before when I was in college, but I had wrist troubles due to a factory job and I had to give it up. Then my cousin called me to say she was having a baby and I was determined to knit a baby blanket. I sat in a park and retaught myself how to cast on, dredged up memories of the motions for a purl stitch, and my new little baby cousin got a fairly electric yellow blanket in a thin acrylic – it was the only remotely baby colored non variegated yarn I could find in all of Tel Aviv. That set me off on years of knitting joy and obsessiveness. I would order yarn online and have it delivered to my folks and they’d bring it to me when they came on annual visits. I knit blankets and scarves and sweaters and mittens, and then I discovered lace and knit probably 50 shawls and wraps. I ran out of people to give them to. Nearly finished fingerless gloves – I’m taking these to get them done and because I’ll need the needles for the sock knitting. 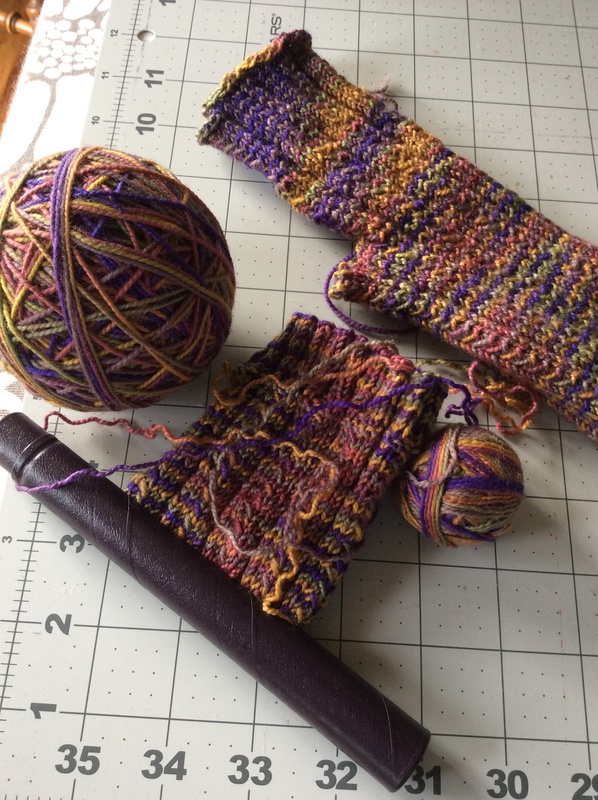 Knitting led to spinning and fiber fairs and classes and hand dyeing, and a knitting group run by a friend from college who I’m now in daily crafting conversations with. (Hi, Paige!) 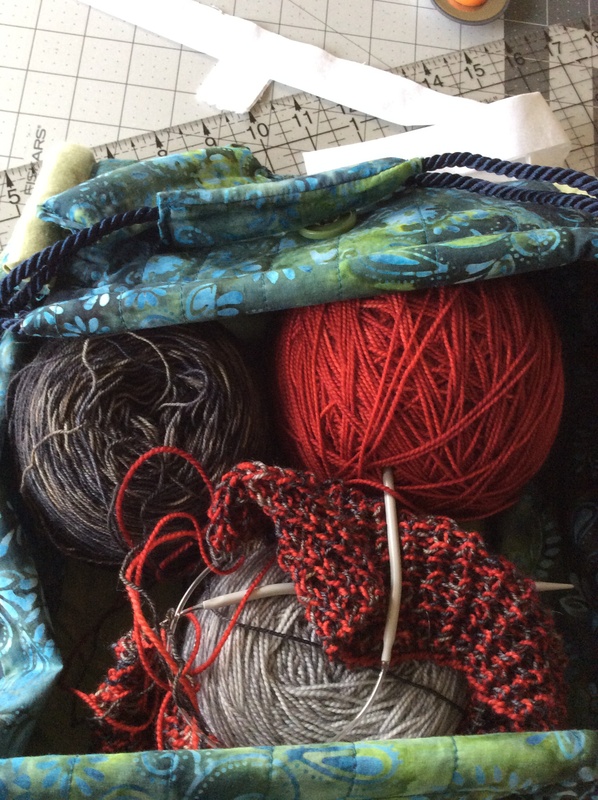 Yarn has been an amazingly comprehensive part of my life for 12-13 years. When we moved down to Portland a couple of years ago, it was an embarrassment to me how much yarn I had to pack. 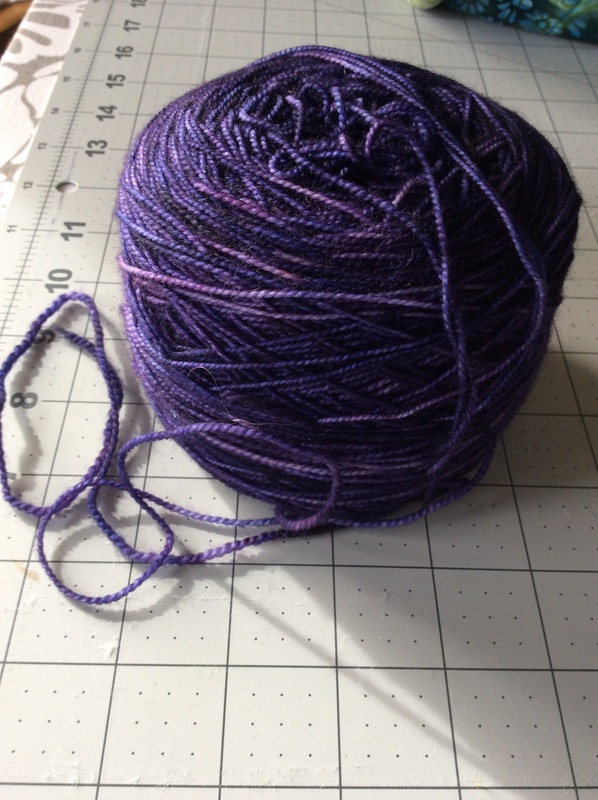 I dyed this purple to knit into socks. And even though a year and a half ago I jumped whole heartedly into quilting, knitting remains a constant. I don’t go anywhere I might have to sit for a while without yarn and needles. I can barely watch TV or read a book without needles in my hand. I’ll never be able to wear all the cowls and scarves and shawlettes, and I’m running out of people to give them to! Knitting is happiness, and calm, and entertainment whenever I need it. Which means a lot of yarn going into my suitcase.